Here is a new "TOP" to help you understand spoken English through "Training with Oral Practice" based on quotes and song lyrics. This episode is based on one of my very favorite songs by U2. There are a few minutes of oral exercises, and the rest is sing along! Not too tiring I hope! Though this podcast is quite a bit longer than the others because of the music we added. Click on the icon below to get the recording or go to the iTunes store to subscribe. If you wish to access all four of our FREE series quickly, type "Marianne Raynaud" in the search window of the iTunes store. For this transcript in DOC and the previous transcripts in PDF and DOC, go to the store where you will find a pack of transcripts for the TOPs at a minimal price. If you want to go on, TOP 23 is coming up soon. You can also work on our previous 5-Minute TOP episodes. Write us with your comments if you are progressing with our three series of podcasts for intermediate to advanced learners. We are also interested in your ideas for the future episodes. If you want to practice with lyric clips here are links to great videos. Enjoy! And sing as much as possible! If you are looking for effective teaching materials, read about QualityTime-ESL: The Digital Resource Book Version 2.0 in a downloadable version, go to the store. 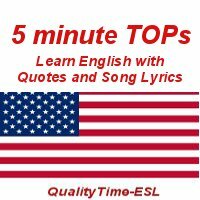 Music Links for "5-Minute TOPs"
en Free ESL Podcasts 5-Minute TOPs ?